LaHood's escalating campaign may limit the growth of Ford's Sync and other features being added by automakers to attract younger buyers. WASHINGTON (Bloomberg) -- U.S. Transportation Secretary Ray LaHood says he believes motorists are distracted by any use of mobile phones while driving, including hands-free calls, as his department begins research that may lead him to push for a ban. 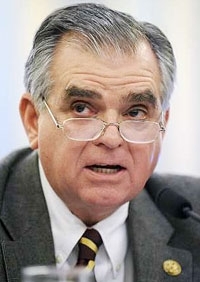 LaHood, whose campaign against texting and making calls while driving has led to restrictions in 30 states, says his concerns extend to vehicle information and entertainment systems such as Ford Motor Co.'s Sync and General Motors Co.'s OnStar. “I don't want people talking on phones, having them up to their ear or texting while they're driving,” LaHood said in an interview this week. “We need a lot better research on other distractions,” including Bluetooth-enabled hands-free calls and the in-car systems, he said. Even without a ban, which would have to be implemented by individual states, LaHood's escalating campaign may limit the growth of vehicle features such as Sync, being added by automakers to attract younger buyers. His push also may reduce calls made from vehicles and the revenue of mobile-phone companies such as Verizon Wireless and AT&T Inc.
LaHood, 64, said even hands-free phone conversations are a “cognitive distraction.” Calling for a ban on hands-free communications is a possible outcome of research under way at the Transportation Department's National Highway Traffic Safety Administration into all driver distractions, Olivia Alair, a department spokeswoman, said. LaHood plans to meet with the heads of all makers of cars sold in the United States to discuss their cooperation in limiting distracted driving, he said in the Oct. 5 interview. He said he's not yet recommending restrictions on hands-free phone calls and didn't say when he might make a decision. The transportation secretary may have little chance of getting a ban by the states even if he decides one is justified, said Christopher King, a telecommunications analyst at Stifel Nicolaus & Co. in Baltimore. The Transportation Department's powers to push further limits on distracted driving range from exhortations to setting standards backed by the federal government's financial clout. The government previously awarded highway aid to states based on whether they raised the legal drinking age to 21 or required seatbelt use. The Alliance of Automobile Manufacturers wants to make sure regulators don't prohibit a wireless link in cars, said Wade Newton, a spokesman for the group, whose 12 members include Ford, GM and Toyota Motor Corp.
Newton cited technologies that can automatically alert emergency responders if a car crashes and systems being developed that would alert drivers to changing weather or accidents ahead on the road. The Transportation Department estimated about 5 percent of all drivers in 2009 were using mobile phones in their cars at any given time. LaHood began campaigning last year to limit driver distractions that he says caused 5,474 deaths in 2009 and accounted for 16 percent of all road fatalities. The total was a 6 percent decline from 5,838 in 2008. The Insurance Institute for Highway Safety, which has said LaHood is focusing too much attention on distracted driving instead of other safety pursuits, released a study last month concluding laws banning handheld texting don't reduce crashes. The study, using data from four states before and after they enacted anti-texting laws, found the overall number of crashes increased in three of the states. The increase may stem from drivers taking their eyes off the road even more as they try to hide their phones from view while texting, Adrian Lund, president of the industry-sponsored group, said in an Oct. 5 interview. Federal guidelines are planned next year to put into writing LaHood's views on how much, if any, mobile communication by the driver is appropriate when a vehicle is in motion, said Ronald Medford, NHTSA's deputy administrator. OnStar, with about 5.7 million subscribers, is testing an application that would let users make audio updates to their Facebook pages and have messages from the social-media site read to them while driving. The system already provides crash- notification services as well as directions and information such as vehicle diagnostics. Rebecca White, an OnStar spokeswoman, declined to comment. Ford has been selling Sync, based on Microsoft Corp.'s voice-activated technology, since the 2008 model year. The automaker added features such as touch- command controls and voice-activated climate control this year. Ford said in January it plans to bring social networking, Web browsing and thumb controls similar to those on Apple Inc.'s iPod to 80 percent of its models by 2015. “Research clearly shows that voice-controlled connectivity technologies provide substantial safety benefits because they allow drivers to keep their hands on the wheel and eyes on the road -- key factors in reducing driving distractions,” said Wes Sherwood, a Ford spokesman. “Car manufacturers always say ‘safety is our No. 1 priority,' but yet you invest your money into developing these systems where you can update your Facebook status,” said Jennifer Smith, president of FocusDriven, a group whose founders lost family members in distracted-driving-related car crashes and wants all cell-phone use by drivers banned. Chrysler Group, which encourages drivers to use hands- free devices if they need to talk and drive, is sponsoring a Car and Driver magazine cellular phone application called TXT U L8r that responds to text messages with an alert that the person is unavailable, said Esperansita Bejnarowicz, a social-media manager at Chrysler. The U.S. wireless industry generated $152 billion in revenue last year from 2.3 trillion minutes of use, according to CTIA -- the Wireless Association, a Washington-based trade group that represents mobile-phone services. The campaign against distracted driving and the use of mobile phones in the car will continue in stages, LaHood said.